At CES, several vendors offered “second screen” monitors either intended to be used as “accessory” screens to complement a larger monitor or to serve as a single purpose screen to keep tabs on specific content. It’s a neat concept, with some neat designs, that is only possibly now because of lower costs, increased supply, and new technologies and concepts like the Internet of Things. Case in point, the Vikaura Screen, a companion screen for iOS devices. 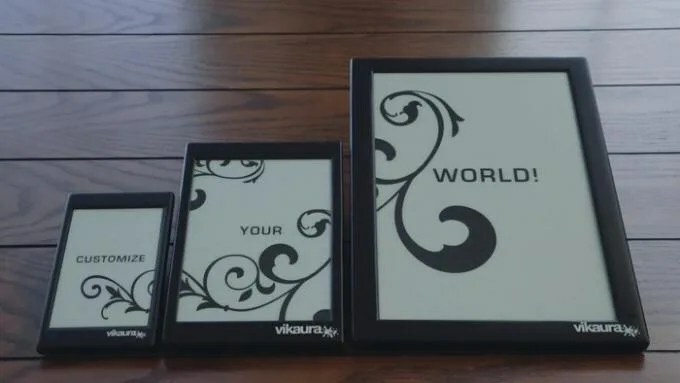 Think of the Vikaura as a black and white digital picture frame, but unlike previous attempts, it is wireless, thanks to Bluetooth, and the battery works for years. This is possible because the Vikaura operates like an e-ink Kindle or Nook e-book reader. No power is consumed when the display is constant. Power is only used when the screen changes. The Vikaura is app-enabled and there will be available to third party developers. The Vikaura launched on Kicksarter in 4-inch, 6-inch, and 9.7-inch models, ranging from $99 to $199 and should retail this summer for $129 to $229. 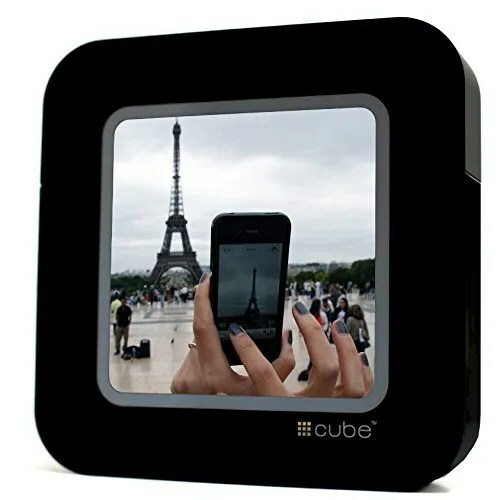 A true full-color Digital Photo Frame, that is available today, for $149, is the Hashtag Cube, or #cube. This cubic (actually rounded square) device is designed to work with social media, as it scours the Internet in real-time for the hashtag(s) you specify, and displays tagged photos. Grandparents can follow their family’s photos of a recital they couldn’t attend by using a custom hashtag like #BernhardFamilyPics or you can use the Hashtag Cube for business purposes or for fun. A company could monitor their corporate hashtags and a sports fan could do the same for teams they follow. 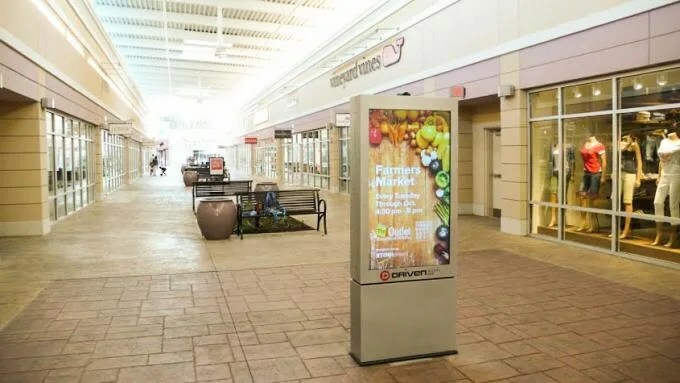 Businesses can also check out the Enplug Interactive Display, for $148 and $99/month. This gadget hooks up to a flat screen TV via HDMI and displays social media in an attractive way. It makes for a nice lobby display, restaurant specials board, mall advertising, or electronic billboard. You can also provide your own PC and run their app, instead of buying the $149 device. 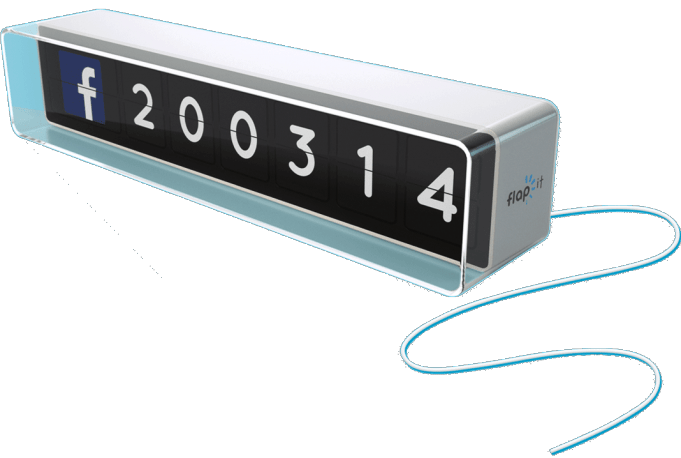 The Flapit Digital Counter is an adorable throwback to the old-fashioned flip displays you might find in an old railroad station. It combines the old-world feel with modern wireless technology and symbols for Facebook, Twitter, and others. This allows a business to track and display data like Likes and Follows in real time. As long as you want to display only up to six characters and the built-in icons meet your needs, it could work. It’s cute, but the $299 price tag for such a limited device is a bit hard to swallow when there are more affordable alternatives, with more options. A more flexible and cheaper option is the LaMetric Dashboard and Speaker, which starts at $149 which represents a $20 pre-order savings. The LaMetric is available in wired or battery operated ($30 more) versions, in black or white; and because it uses an oversized “dot matrix” type of display, it can show a wide variety of options, including animations. It’s also a speaker, which means it can play custom sounds. Using a web form, users can program the screen to display the content they want, including discounts and other offers. The screen is a bit small, with space for up to seven characters plus an app icon, but you can daisy chain two or three units for a longer message. It can also serve as a clock and as a Bluetooth speaker, which is a nice touch. This entry was posted in Apple news and tagged air play, Second Screens, Vikaura. Bookmark the permalink.